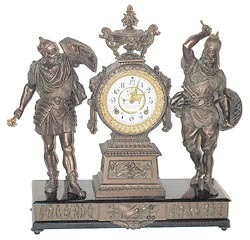 Ansonia Clock Co. figure clock, the "Combatants", ca 1894. One of their most poplar double statue clocks. Individually they are Attila and Mars. This one has been in a private collection for many years, and well protected. As nice and original as you will find. The enameled iron base is 19 inches wide and has a Frieze of Roman characters across the bottom. With the clock tower it is 21 inches high. The metal is finished in French Bronze and retains all the finish. Original pendulum and weapons.Movement is 8 day, striking a gong on half hours., and running. 2 piece porcelain dial with open escapement, Rocco sash, beveled glass, all near perfect. If you want one of Ansonia\'s most poplar double statue clocks, and want it near perfect, this is the one. Ly-Ansonia No.478.